Have you ever wanted to travel the world? You can do it through food and cheese is one ingredient that is so different from country to country. Here in North America we are accustomed to cheeses made from cow’s milk but we are slowly warming up to the idea of more exotic tastes like sheep’s milk and goat’s milk cheeses. How about buffalo, blue or even sweet cheeses? There are even cheeses made of donkey, camel and yak milk! The next time you try out a recipe, get creative and try something different. You can even buy some nice, fresh bread and have a night of cheeses (and maybe even pair them with some wines?). This way you can really experience the differences. I have attended social nights where friends have each brought a different cheese for sampling. It was a fun, creative and cheap way to spend an evening. Here are a FEW of the more popular cheeses from around the world that might be a bit different than your usual choices. Where will your palate take you next? 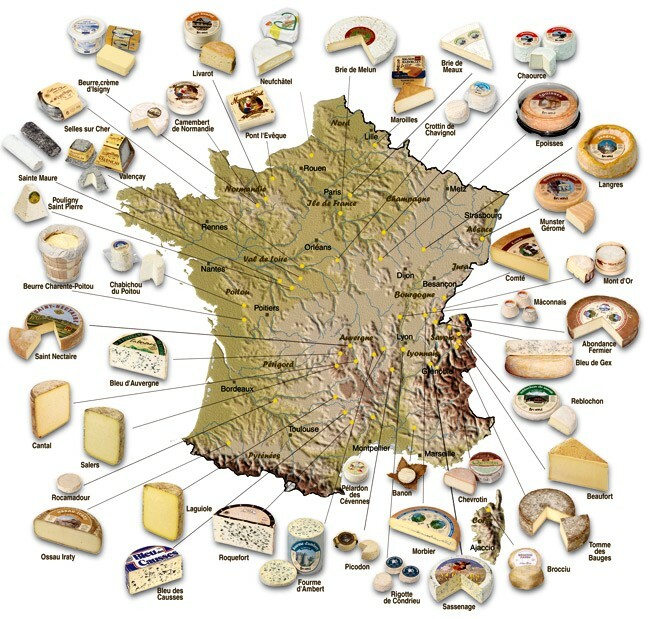 In the end, I think there is one country that is the clear winner as far as cheese goes and that is France. Perhaps after viewing the map below you might agree!